0: Put a +1/+1 counter on each creature you control. 0: Remove a counter from any number of permanents you control. Put a loyalty counter on Narlarp, Spark Injected for each counter removed this way. -7: You get an emblem with "Creatures your team controls get +X/+X, where X is the greatest number of counters on a permanent you control." Narlarp, Spark Injected can be your commander. (2/3) Appeal: Naturally, a commander card does appeal to Txmmy. Ability wise Narlap's also kind of a Txmmy card, buffing your whole team and ultimately giving a potentionally huge bonus to everything on your side of the board. There's also some combo potential for Jxnny to play around with. I'm thinking of cumulative upkeep. (3/3) Elegance: The card is easy to understand and makes sense. (3/3) Viability: If it wasn't for the Simic I'd say the messing with counters here is mostly green. The rarity is correct. (3/3) Balance: It has no built in protection nor does it net card advantage, two things that make planeswalkers very powerful. This one feels a little like the new Dovin to me, in the way I'm going to use him. The plan is to have a lot of creatures to get Dovin really high in loyalty first and ultimate him a few turns in a row. Narlap here can be used kinf of in this way if needed or just put one counter on each creature if that's sufficient to win or do stuff. Ultimating this once nets you a pretty powerful emblem. But also, as said, it doesn't have the ability to protect itself, besides getting counters, and feels not overpowered this way. (2/3) Uniqueness: We have a bunch of planeswalkers that a good at putting counters on stuff. The first ability we have seen in some iterations. The rest is pretty exciting. 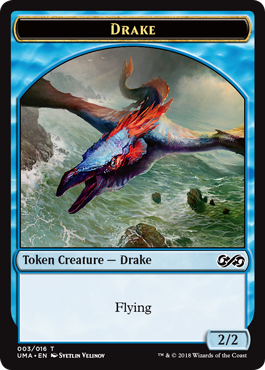 (3/3) Flavor: Injecting a spark feels like the appropriate way for a Simic person to ascend to a planeswalker. (3/3) Quality: No flaws detected! (2/2) Main Challenge: Main challenge satisfied! (2/2) Subchallenges: Both subchallenges satisfied! +1: Untap up to one equipped creature you control. That creature can block an additional creature. +1: Reveal cards from the top of your library until you reveal an Equipment card. Put that card on top of your library and the rest on the bottom in a random order. -X: Create Sword of Asha, a legendary green and white Equipment artifact token with indestructible, equip 2GW and "Equipped creature gets +X/+X, has lifelink, and can't be blocked by more than one creature." Mubin of the Blessed Forge can be your commander. (1/3) Appeal: Naturally, a commander card does appeal to Txmmy. (2,5/3) Elegance: The card is mostly easy to understand and makes sense. Memory issues might become a thing, though, when you use the ability a few times on the same creature as it will be able to block more and more creatures. Something like "until end of turn" would be helpful. (3/3) Viability: GW surprisingly can care for equipment, as seen with Nazahn, Revered Bladesmith. The rarity is correct. (3/3) Balance: They untap a creature that attacked or tapped otherwise, maybe to tap it again. The second ability makes sure you get your next equipment ready asap. Or you insta-cash Mubin in for the legendary Sword of Asha, that works almost like a Behemoth Sledge. A heavy equipment theme like this best suits a voltron strategy of course. The twist is that your commander can't carry any weapons so you have to find others that are willing to pick up the fight. 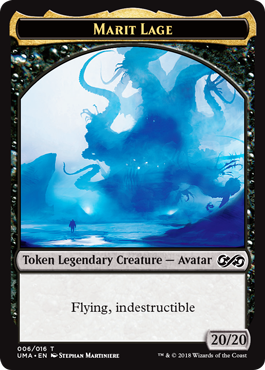 Compared to Nahiri, the Lithomancer, a planeswalker commander with a similar set up, Mubin adds green to the color identity of your deck and mostly makes sure that your equipment strategy works smoothly. Too powerful I don't think this is. (2/3) Uniqueness: It's very similar to Nahiri while still offering a slightly different angle to the equipment deck. (3/3) Flavor: Looks like a nice representation of the charater of the Alara storyline. (2/3) Quality: "Untap up to one" should probably target. In Nahiri there's only one card to reference here, but I think it's fair to say that the text of the equipment token should be listed in the order it would appear on an acutal equipment card. That means the equip cost goes to the end. (1/2) Subchallenges: Subchallenge 2 satisfied! +1: You may discard a card. If you do, draw a card and create a 1/1 white Warrior creature token with haste. -2: Creatures you control get +1/+0 and gain vigilance until end of turn. -6: You may cast a noncreature spell with converted mana cost X or less without paying its mana cost, where X is the number of creatures you control. Fenyang, Liu’s Student can be your commander. (2/3) Appeal: Naturally, a commander card does appeal to Txmmy. At three mana this feels aggressively enough to be considered a Spike card. (3/3) Viability: The abilities fit the color identity well. The rarity is correct. (3/3) Balance: As said, Fenyang feels pretty aggressive. It filters and creates a blocker to attack or protect itself early in the game. It pumps your army once while still leaving behind blockers later. The third ability feels epic but might not even needed. It reminds me of Aminatou, the Fateshifter, where either the first or the second ability is good enough to justify building a deck around it. Here the first two abilities together support a go wide creature strategy while fixing your draws. Still it doesn't feel unbalanced, it doesn't create an environment that's impossible to counteract. Three opponents will have a chance. (2/3) Uniqueness: Besides the third ability we have seen each part already on planeswalkers in some form. The whole package feels coherent and interesting though. (3/3) Flavor: Fenyand's certainly a studend of Liu. (2,5/3) Quality: I think the third ability must specifiy from where to cast the card, see Electrodominance for reference. 0: Put a loyalty counter on Caolán, Ascended Cenn for each token you control. -X: Create X 1/1 white Kithkin Soldier creature tokens. You gain X life and draw X cards. -3: You get an emblem with: "If an effect would create one or more tokens under your control, it creates that many plus one instead." Caolán, Ascended Cenn can be your commander. (3/3) Appeal: Naturally, a commander card does appeal to Txmmy. The third ability here is an invitation to all Jxnnies. While the -X is the obvious value ability it's the -3 that might turn this into a Spike worthy card. (2/3) Balance: The non-0 abilities seem pretty relevant at any point in the game. Paying 4 mana for 3 tokens, 3 cards (and 3 life) is a pretty decent rate. Paying 4 for a half a Adding Season is also pretty good. You can cash it in for either thing on turn 4 and don't look back. The option to pump Caolán up a little more before you use the more impactful abilities becomes more important with the second and subsequent casting. One good pump turns the -X in an ability with game deciding potential. While the -X delivers a good one time boost it also needs a bit of work. It is the -3 that I find problematic. Getting another token out of each token creating card for free turns every normal-rate card into an above-rate card and each decent-rate card into an absurd-rate card. That emblem is too good for a one time investment. Upping the loyalty cost even by 1 might turn this into a fair card already. Maybe it's nothing 3 opponents can't handle when working together, but out of the bunch I think it leads to probably the most problematic commander. 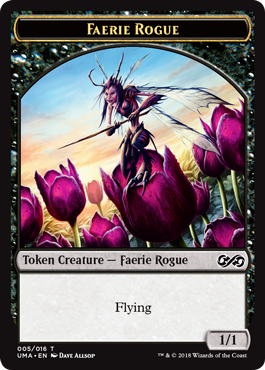 (2/3) Uniqueness: We know token creating and card drawing and life gaining planeswalkers. This feels pretty fresh anyways. (3/3) Flavor: Planeswalker kithkin, very exciting! (2,5/3) Quality: Colons are only used to separate activation cost from an activated abilitie's effect and is not needed here. Whenever an opponent casts a noncreature spell, create X 1/1 white Kithkin Soldier creature tokens, where X is that spell's converted mana cost. 1(G/U)W: Until end of turn, Kithkins your team controls get +2/+2 and gain "Whenever this creature deals combat damage to a player, you may draw a card". Activate this ability only once each turn and only if your team controls six or more Kithkins. Through light or darkness, a cenn's job never ends. (2/3) Appeal: Multiplayer is a natural Txmmy format. Being able to generate an absurd amount of tokens should also be interesting. Generating tokens and drawing cards on a legendary creature reads like a card Jxnny would build around. (3/3) Viability: The abilities fit the colors. Mythic is a good spot for this. (2,5/3) Balance: It's good to have another Kithkin commander. Multiplayer formats tend to be naturally balanced, as players usually attack the player in the best position at any time. I still think this guy is pretty strong, even for multiplayer standards. All those tokens should add up fast. Opponents that aren't far ahead or mostly creature based probably have no chance against this. (3/3) Uniqueness: Feels like a onesided Dovescape but it's so much more. (2,5/3) Quality: The plural of Kithkin is Kithkin. When Maskio Warscreamer attacks, you may pay R, if you do, creatures your team controls get +1/+0 until end of turn. When Maskio Warscreamer attacks, you may pay B, if you do, creatures your opponents control get -0/-1 until end of turn. (1/3) Appeal: Multiplayer is a natural Txmmy format. Swinging into combat with this feels epic. (3/3) Viability: The abilities fit the colors. Rare is a good spot for this. (3/3) Balance: This should be a fun card to play with and reasonably nightmarish to play against. (2,5/3) Uniqueness: Mass increase or decrease of stats is not new. (3/3) Flavor: The warscreamer aspect is coming through. (2,5/3) Quality: "If you do" should start a new sentence. Equipment your team controls have "Equipped creature gets +2/+2" and "3: Attach this Equipment to target creature your team controls. Activate this ability only any time you could cast a sorcery." Equipped creatures your team controls can't be blocked by more than one creature. (1/3) Appeal: Multiplayer is a natural Txmmy format. Equipment get pretty mighty with this on the field. (3/3) Balance: Another legendary Rhino would be nice. This new equipment commander looks good and balanced. (2,5/3) Uniqueness: This would be the 9th equipment commander. (3/3) Flavor: Handing out equipment to anyone who needs it. (3/3) Quality: No flaws detected. Though, the first ability modifies what equipment can do, whereas the second ability modifies equipped creatures. Both abilities could be written either way, making the equip ability just one of Javi's. What led to this version? (1/2) Subchallenges: Subchallenge 1 satisfied! 3U: Up to two target players draw a card. Any player on your team may activate this ability. 2R: Deal 2 damage to any target. Any player on your team may activate this ability. Even given his alias, most expect Kylem's most infamous fixer to be taller. (1/3) Appeal: Multiplayer is a natural Txmmy format. (2,5/3) Balance: A legendary imp! This seems like a real fun team card. Not for your opponents, of course. Having such an efficient mana sink for the whole team, that also regains life, feels really, really good. (2,5/3) Uniqueness: Dealing damage and drawing cards. Is their real name Niv-Mizzet by any chance? (3/3) Flavor: Flavor is fitting for Kylem. (2/3) Quality: I think it should be "Up to two target players each draws a card. ", see Huddle Up. The Short Man is the source of the damage, this has to be written out. Creatures your team controls get +1/+1. 4G, T: You gain life equal to the highest power among creatures your team controls. Maraja, one of Naya's finest commanders, found her true home on Bant. (1/3) Appeal: Multiplayer is a natural Txmmy format. Gaining bunches of life should be nice. (3/3) Balance: A fun and balanced team card. (2,5/3) Uniqueness: Anthem on a stick and life gaining are not really new. (3/3) Flavor: More info on Alara is always welcome! Whenever you or a teammate casts a noncreature spell, creatures your team controls get +1/+1 until end of turn. 2R, T: Target creature your team controls gets +X/+0 until end of turn, where X is its power. (1/3) Appeal: Multiplayer is a natural Txmmy format. A few spells turn a few creatures into reasonable threats. (2/3) Balance: Zhi here is pretty powerful. Counting all the spells your team plays feels like it would get overwhelming. You can control the game and win the game with a few creatures out of nowhere. (2/3) Uniqueness: A dash of Jeskai Ascendancy, a mouthful of Wine of Blood and Iron but without the need to sacrifice. (3/3) Flavor: Legit Jeskai flavor. Creatures you and your teammates control enter the battlefield with an additional +1/+1 counter on them. XU: Until end of turn, creatures you and your teammates control with a +1/+1 counter on them have base power and toughness X/X. "Evolution is effective but slow. I suggest a rapid method." (2/3) Appeal: Multiplayer is a natural Txmmy format. Pumping the whole team to X is great. +1/+1 counters are a toy for Jxnny. (3/3) Balance: Buffing the whole team at a reasonable level. (2/3) Uniqueness: Kind of a simic Mirror Entity. 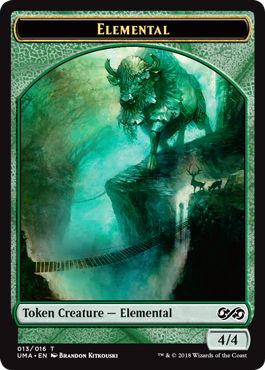 (3/3) Flavor: That's some good simic flavor. It might take another day or so but can someone else from round two advance to three? From the remaining contestants soramaro got the most points. Otherwise I like the edited option, so two judges do B and C, and two do only A. I would do B and C.
Electrostatic Surge deals 2 damage to each of X target creatures. Tap each creature dealt damage this way. “Result 317: Remained conscious for entirety of trial. Directional control seems to now be functioning as expected." (0/3) Appeal: I have a hard time seeing any player type reflected here. It's not splashy enough for Txmmy. There's no untapped combo potential in tappin creatures. And for Spike this card might be a tad too weak. (3/3) Viability: Red, blue, damage, tapping, rare, yes. (3/3) Balance: Compared to Winter Blast this seems about right. I sense no brokenness. (2/3) Uniqueness: Besides Winter Blast I see a good amount of Aurelia's Fury here. (1/2) Main Challenge: The main challenge, in its most literal interpretation, is satisfied. Yet the entry is not in the spirit of the challenge. This is not a card about teamwork. 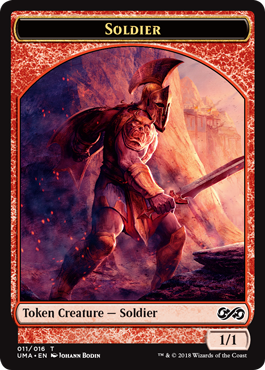 When Timely Tactician enters the battlefield, target player creates three 1/1 white Soldier creature tokens. Creatures that player controls gain first strike until end of turn. "Heard you were having a bad time. It's okay, now." (1/3) Appeal: Txmmy has a natural affinity for everything multiplayer, this card also ticks the lots-of-power box. (3/3) Viability: All these things are kind of white. Rare is fine. (3/3) Balance: Six first striking power and 1 additional power at instant speed makes this a good combat trick that might swing the game for you. Not bad for six mana but not broken in a multiplayer environment. (2/3) Uniqueness: A clear reference to Timely Reinforcements and also some parallells to Celestial Crusader. Lieutenant- As long as you control your commander, whenever you would be dealt commander damage, you lose that much life instead. Whenever your commander enters the battlefield, if Hierophant of the Beyond is in your graveyard, put it onto the battlefield. (2/3) Appeal: Txmmy likes commander and its cards. Is there a way to abuse this recursion ability? I'm asking you, Jxnny. (3/3) Viability: Commander damage prevention, kind of, this is new but feels white. Recursion is black. Seems about right. (3/3) Balance: So, it transforms damage, weird! Things that interact with life lost already interact with commander damage, so this doesn't open up any new ways to abuse this I can think of right now. I don't know how strong this card is. An opponent who wants to win through commander damage has to attack twice as often if this remains on the battlefield. This might buy some time but is no replacement for actual answers or own threats. (3/3) Uniqueness: A card like this I have not seen so far, not in actual magic and not as custom card. (3/3) Flavor: Weird card with strange ability and mystical name. But maybe it's just beyond me. (2,5/3) Quality: "Whenever" indicates this is a triggered ability, "instead" indicates this is a replacement effect. An ability can't be both. Probably simply write ", if you woud be dealt . . ."
(2/3) Appeal: Voting cards are Txmmy cards by design. Messing with counters is a Jxnny thing. (2/3) Viability: This feels like a rare, but this being a green card seems pretty weird. Hunting is green, yes, but forced sacrificing of any permanent is mostly white. Green can let people sacrifice artifacts, enchantments and nonbasic lands. (2,5/3) Balance: This is a powerful tool to control the board state and team up against players that are ahead. The problem I see is, that once this card starts punishing the top player, it will punish them each turn, wheter or not they're still ahead. For them the game might turn unfun as they'll lose more and more cards. Good that it also allows player to punish you if necessary. 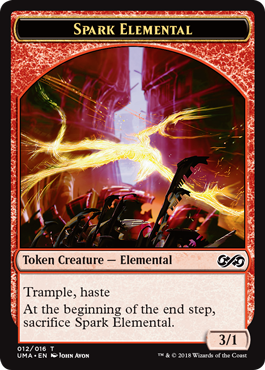 If we assume that this card currently is indeed problematic one could put a counter on the enchantment each turn and then force the chosen player/s to sacrifice that many things. (2,5/3) Uniqueness: There's only one vothing card that allows the group to really direct its effect to one player, that is Council's Judgment. Other voting cards would "spread the love" or do something different. The again, it's kind of an even meaner Smokestack, a pretty iconic card. (2/3) Flavor: Having bounty counters for me indicates that you get something if you catch/kill the thing with a bounty counter, see Mathas, Fiend Seeker. Here it's downright punishment, without any direct gain for others. The effect feels more like repressions. (0,5/3) Quality: So there are a few things: It's "council", not "concil". There should be a space before and after the dash that separates the ability word and the effect. In this case it's "tied", not "ties". Names of counters aren't written in capitals. No comma after "Then". "Then all players" is used on one card, Goblin Game, there it comes right before a physical action all players do at the same time. More often used is the phrase "Then each player". The ability could simply read "Then each player sacrifices a permanent for each bounty counter they have." This should end with a dot anyways. Etherium Phylactery enters the battlefield tapped. T: Join Forces - Starting with you, each player may pay any amount of mana. Put that many charge counters on Etherium Phylactery. 2WW,T, Exile Etherium Phylactery: Each player's life total becomes the amount of charge counters on Etherium Phylactery. Activate this ability only if there are at least five charge counters on Etherium Phylactery. Eternity is best spent in good company. (2/3) Appeal: Txmmy likes multiplayer cards. I can Jxnny doing weird things with this. (3/3) Viability: This type of life total change feels white. Rare seems appropriate. (2,5/3) Balance: At the very least this card forces each player to not spend their mana on other things, if they want to prevent them from losing too much life. If you time this accordingly or manipulate the board state, you can set each player's life total to five on turn four upwards. I'd compare this to Repay in Kind as making each player lose a bunch of life seems like a good plan with this phylactery and usually more attractive than the group hug alternative. Repay in Kind comes down on turn seven and needs a lot of life lost in the first place. While having the phylactery come into play tapped helps balancing it, it still feels pretty powerful. (2,5/3) Uniqueness: There are only a few cards that set each player's life total. This is a good addition. (3/3) Flavor: When used as described this will lead to everyone's death faster than to an eternity spent together. But the flavor is still good. (1,5/3) Quality: There should be a space between "2WW," and "T". The life becomes the number of charger counters, e.g. Eternity Vessel. It should probaby be "Activate this ability only if there are five or more counters on ~." "At least" is used when a number is compared to another number, appears on two cards this way, see Isolated Watchtower and Ayli, Eternal Pilgrim. "Or more" is used on 50 cards, generally when things are counted, e.g. Argent Sphinx. Will of the council - When Judge of the Dead enters the battlefield, starting with you, each player votes for Servitude or Doom. If Servitude gets more votes, Exile target creature card from a graveyard. 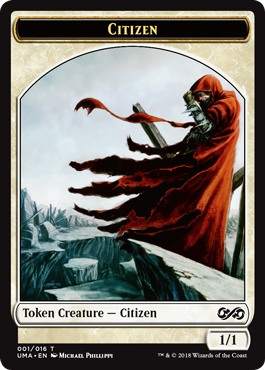 Create a token that's a copy of card exiled this way except it is spirit in addition to its other types. If Doom gets more votes or the vote is tied, destroy target creature. 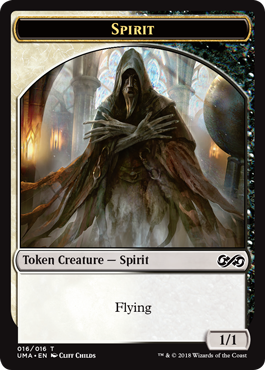 "the Orzhov collect the debts of those who died in the afterlife or punish them eternally." (1/3) Appeal: Voting cards are Txmmy cards by design. (2,5/3) Viability: Creatures that destroy any creatures upon entering the battlefield usually are black. White creatures usually exile creatures. While white never unconditionally destroys single creatures, it can deal with them so this can probably considered a bend. That said, exiling the creature instead of destroying it would not make the card a lot more powerful as it already is. (2/3) Balance: From the batch I judged this card comes nearest to a multiplayer Spike card. It's cheap and pretty good either way and can be abused with flicker effects. It's basically a less controllable Karmic Guide on steroids. Then again, if graveyards are empty, this is just a flier and this uncertainty might turn Spike off. Creatures that reanimate when they enter battlefield cost at least five. Creatures that destroy mostly four or more. This thing probably should not be this cheap. (2/3) Uniqueness: A séanceing Karmic Guide or [/card]Ravenous Chupacabra[/card]. This is a nice mashup. (3/3) Flavor: Flavor text and effect blend well together. (0,5/3) Quality: "Will of the council" has to be in italics. The name of the card and the first reference to it in the rules text are different. The names of the modes must not be written in capitals. Like most words in English "Exile" is not capitalized either if it appears not at the beginning of a sentence. 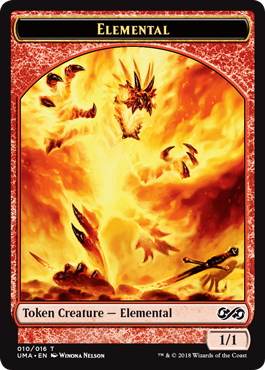 I think the exile effect and the token effect can be simply connected by "and". The way it is it's missing an "a" before "card exiled this way". So it could read ". . . graveyard and creature a token that's a copy of it, except . . . " There comes a comma before this kind of exception, e.g. Séance. The flavor text should start capitalized. Council's dilemma — When Nationalism enters the battlefield, starting with you, each player votes for pride or prejudice. When they do, put a pride counter on Nationalism for each pride vote and exile target nonland permanent for each prejudice vote. Creatures you control get +1/+1 for each pride counter on Nationalism. (2,5/3) Viability: White unconditionally and indefinitely exiling any nonland permanent has appeared seven years ago on Exclusion Ritual the first and only time. 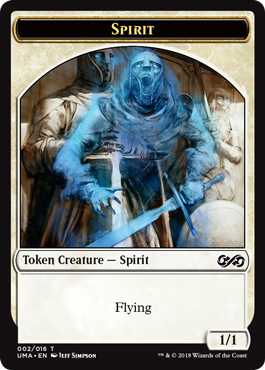 But since then usually white returns permanents if the exiling thing leaves the battlefield. I consider this a bend. (2,5/3) Balance: A nice card if you like politics, in your game, literally. Exiling four nonlands permanents for five mana is a pretty good rate. Buffing all your creatures by 4 as well. Anything in between is also still pretty good. Quarantine Field exiling four things costs ten mana. Getting +3/+3 costs six mana in two colors, see Collective Blessing. I think this card should cost a mana more or so. (2/3) Uniqueness: Hymn or multi exile makes a good dilemma. (3/3) Flavor: Name, voting options and effects make sense. With four judges I'm okey with 12-8-4. 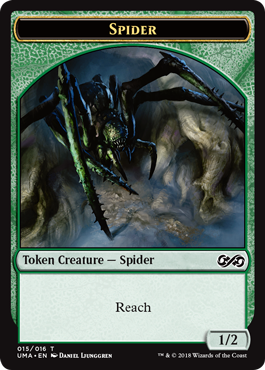 Whenever another nontoken creature you control dies, create a 1/1 black and green Insect creature token with flying. Tap four untapped Insects you control: Return Mazirek, Hivemind from your graveyard to the battlefield. (2/3) Appeal: Txmmy takes a new commander all day. Death triggers and recursion, two of Jxnny's favorite ingredients for combo soup. (3/3) Viability: This has all the things a mythic golgari card needs. (3/3) Balance: This Mazirek is good and shines especially in commander. This would also be the first legendary insect that cares about insects. In constructed I see no place for this guy, though. Playing this for four mana is probably wrong. To efficiently use it one would need a bunch of good insects in the first place and reanimate. Not sure if the insects currently available in standard would make a competitive insect deck. The other route would be a sacrifice based deck, where this works as additional payoff. In limited/sealed this card is somewhat good but certainly not broken. I see no balance issues here. (2/3) Uniqueness: There are only two other and arguably lesser known cards with that trigger + token creation. Both are 4/3 by the way, coincidence? And we have two other lesser known cards that tap creatures of a certain type to return to hand. Both are 4/4, now it's getting weird. Well, return to the battlefield under this condition is new! (2,5/3) Flavor: I feel like it would have to be "Kraul Hivemind" as the word Kraul appears on all kraul and it also tells the player what race this guy belongs to. (G/W), Tap two untapped creatures you control other than Trostani Unified: Create a 1/1 green Saproling creature token. (2/3) Appeal: Txmmy would certainly like this as a commander. Life gain and token production, two of Jxnny's favorite ingredients for combo soup. (3/3) Viability: Fits into selesnya and makes a good mythic. (3/3) Balance: This Trostani makes a good commander where it enables lifegain and token shenanigans. If either of those abilities is impactful enough for a constructed environment I'm not sure, though. In limited/sealed this can take over the game with tokens. For constructed that might be a tad too slow? No balance issues here. (1,5/3) Uniqueness: While none has this exact wording there are several such life gainers, they even have their own deck archetype in several formats. 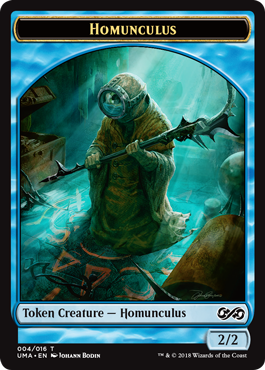 Tapping creatures to create tokens is also known. (3/3) Flavor: Unified in strong contrast to discordant. 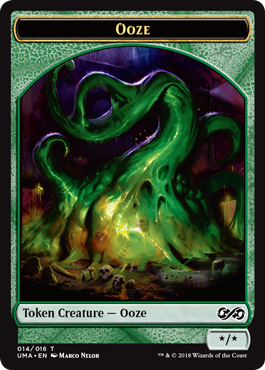 Though, both make tokens so I don't know what to make of that. Them being unified doesn't conflict with the effect, and hints at things going on, leads to questions like "When they're now unified, what happened before that?" Fair flavor. (2,5/3) Quality: It's "Tap two other untapped creature you control. ", e.g. Black Oak of Odunos. Whenever a creature an opponent control dies, you may exile it. 2BG: You may put a creature card from your hand or target creature card from your graveyard to the battlefield. (1/3) Appeal: Txmmy would like to cheat out some big things with this commander. (3/3) Viability: This one is very golgari and mythic in what it does. (3/3) Balance: Here we have basically a beefed up Elvish Piper with nightmare inducing mana cost. Niv-Mizzet, Parun generates extreme card advantage in just a few turns. This Mazirek, while still very good, deosn't seem to have that kind of impact. I see this mainly as awesome commander card and decent limited/sealed card. No balance issues here. (2/3) Uniqueness: Combining the Piper with Zombify and add Leyline of the Void. You've got yourself a neat package there. (3/3) Flavor: Above I said Kraul should be in Mazirek's name and I stand with it, above. Here we have a Mazirek that wants to be the literal embodiment of the Golgari, and feels more important than them belonging to the kraul. Pretty ambitious. (2/3) Quality: "An opponent controls", the s is missing. At first I was unsure if WOTC would consolidate the last ability like that. But I think it's possible. Though, the way it is it reads weird. Things are put onto the battlefield. Also you don't need to target the card in the graveyard, e.g. Tempt with Immortality. I'd go with "You may put a creature card from your hand or a creature card from your graveyard onto the battlefield." B, T, Tell a joke you have not told today: For each other player who laughs about the joke, you may return up to one target creature card from that player's graveyard to the battlefield under your control. For each other player who doesn't laugh about the joke, you lose 1 life. Whenever an opponent casts a spell, put a +1/+1 counter on Koniferius Rimebark. Whenever you cast a spell, an opponent may pay S. If no one does, Koniferius Rimebark deals damage to target creature or planeswalker equal to the number of +1/+1 counters on it. From the mothership. First ever Citizen and black Wurm token and non-foil Marit Lage with crown. At the beginning of your upkeep, put a spore counter on target permanent. It becomes an artifact in addition to its other types. Then, if there's a spore counter on each permanent and it's an artifact, you win the game. When Brinelin, the Moon Kraken enters the battlefield, if it gorged a creature, that creature's controller may search their library for up to two land cards and put them onto the battlefield tapped, then shuffle their library. 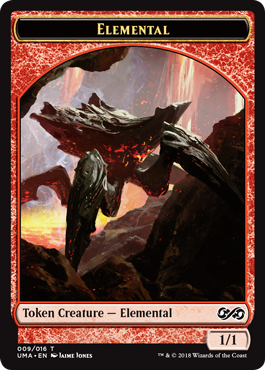 At the beginning of combat each turn, you may let nonbasic lands become 2/2 Elemental creatures that are still lands until end of turn. Antiantiserum posted a message on Launch Giveaway! 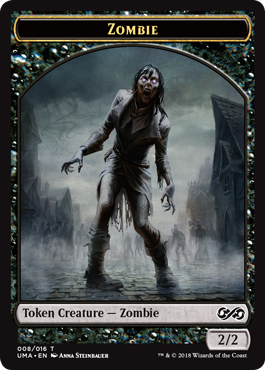 My favorite card is Noxious Ghoul as he is extremely funny to play in a zombie deck.